Really good list! Some of these authors I am not familiar with and I would add Margaret Atwood and Ann Patchett. 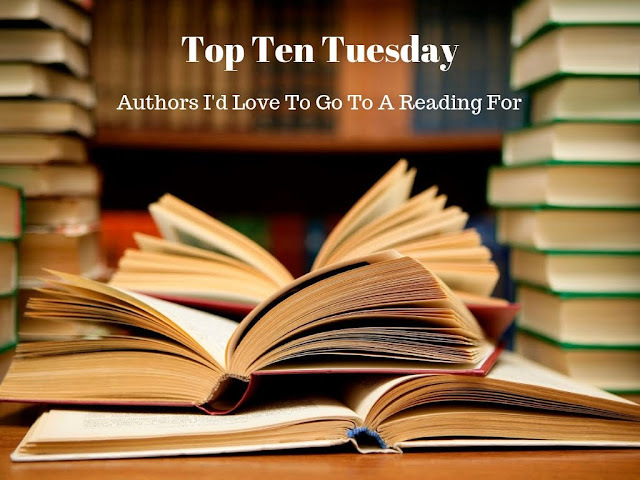 I've never seen Tamora Pierce mentioned on another top ten tuesday and I love you for this! Neil Gaiman would also be incredible to see at a reading. Charlaine Harris and Gaiman would be fascinating, no doubt. I've never read a Gaiman book but I've seen videos of him speaking on books and I think he would have amazing insights! I think Jeffrey Toobin's stuff would be interesting too. Love your twist on the topic! I need to re-read the Alana Books, loved them when I discovered them, really don't know why I never read any other Tamora Pierce. I only ever read the Alanna series and the Wild Magic one, but I want to read more of her work! Ooooh Neil Gaiman. He's so fascinating to me! Good choice. I totally forgot to put him on my list. He writes such good books!